Whether you’re planning a trip to the ocean or you’re thinking about spending a day swimming in a local lake, knowing how to keep your stuff safe at the beach is crucial. 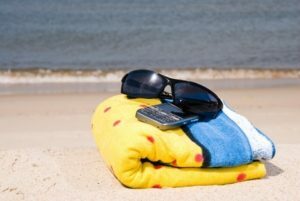 The beach can be a prime hunting ground for criminals, and tucking your smartphone or wallet under your towel isn’t much of a deterrent. Having your valuables stolen is a fast way for a fun day at the beach to turn into a nightmare. Fortunately, there are a few options that allow you to enjoy the water without worrying about someone disappearing with your valuables when you aren’t looking. Do you really need your wallet at the beach? Or your passport? Probably not. Leave them in your hotel room, or lock them away in your car (where they’re out of sight, of course!). If you need to your photo ID or some cash with you, only take as much as you need, and keep it with you at all times. Opt for swimwear with a zippered pocket, and put your cash and ID in a plastic bag to keep it dry. If you’re hitting the beach with your family or a group of friends, take turns guarding your group’s valuables. Make sure there is always at least one person lounging on the beach while everyone else is in the water. This isn’t exactly the ideal system, but it’s a lot better than leaving several phones, digital cameras and e-readers on the beach unattended! Keep your phone, keys and other valuables with you in the water by stowing them in a waterproof container. Waterproof boxes and bags come in an endless array of sizes and styles. Find one that will fit in a zippered pocket, or opt with something that has a secure wrist strap. The ocean is one of the worst thieves of all, and if your container isn’t secured in a pocket or attached to you in some way, you can kiss it goodbye. Most criminals are looking for an easy target. Chances are, they aren’t going to the time to thoroughly search through your stuff. If they don’t see something interesting right away, they’ll probably move on to an easier target. Don’t throw away that empty sunscreen bottle; clean it out, and use it to hide your valuables in plain sight. If you don’t want to take a DIY approach, there’s a huge market for stealthy safes that burglars won’t even give a second glance. Unfortunately, there’s no guaranteed way of keeping valuables safe at the beach. Whether you’re soaking up some rays on a crowded beach along the ocean or you’re spending a day at the local pool with the kids, common sense is always your best defense against theft. Don’t bring more than you actually need, and never leave valuables in plain sight. With a little bit of caution and forethought, you can usually avoid becoming a victim.